Color: Twilight's fur is a soft charcoal black, some of his bangs have blonde highlights. Blonde colored fur also borders the white tips of his tails. All of his blonde fur looks as if it were bleached, not natural. Skin Color (i.e. muzzle, arms): Under his fur, Twilight's skin appears to be pitch black. Hair/Quill Style: Twilight's bangs hang over his white muzzle very slightly, the rest of his hair is tied back in a ponytail with a lavender colored ribbon. Attire: Twilight wears a dark red trench coat that runs all the way down to his ankles. He also wears faded jeans with two black straps hanging off the sides where the pockets would be. In addition to this, he also wears sneakers that are a bold blue color with white markings on the top. An emblem hangs around his neck on a black strap. Half of if looks like a sun, and the other half is a moon. These jewels look unnaturally combined. The sun half glows in the daylight, and the moon half glows at night. At first glance, Twilight appears to be an apathetic character. He doesn't seem to care that much about anything, often staying out of other people's business whenever he can happen to avoid it. He believes that most everyone is inferior to him, having a bit of a superiority complex to make up for his own faults. Though he seems indifferent, this is because of his abnormal heart (or "core"). It seems to be malformed and has trouble keeping itself together. He often forgets the feeling of most emotions because of this. He is constantly re-learning emotions he had previously felt, and even learning new emotions he had never felt before. It becomes almost overwhelming to him sometimes, which is why he tends to stay away from people. The feeling of all these emotions constantly being forgotten and re-learned can only be described as a sound so grating on the ears that it's almost maddening. The shadow has gotten used to the screeches and sounds inside of his head, but because of them he often gets headaches. The only way he can release all of this negative energy is through fighting, using the negative energy to enhance his own dark powers. Because of this, whenever he is around anyone he prefers to try and start fights. He still tries to avoid being around people, especially crowds, as he doesn't really like people in the first place anyhow. It is very hard to make friends with him. Combat Type: He relies on his speed and wit in battle. Dark Claws: Using his Umbrakinesis, Twilight can create strong, sharp claws out of darkness to attack his enemies with. These claws cover his hands. 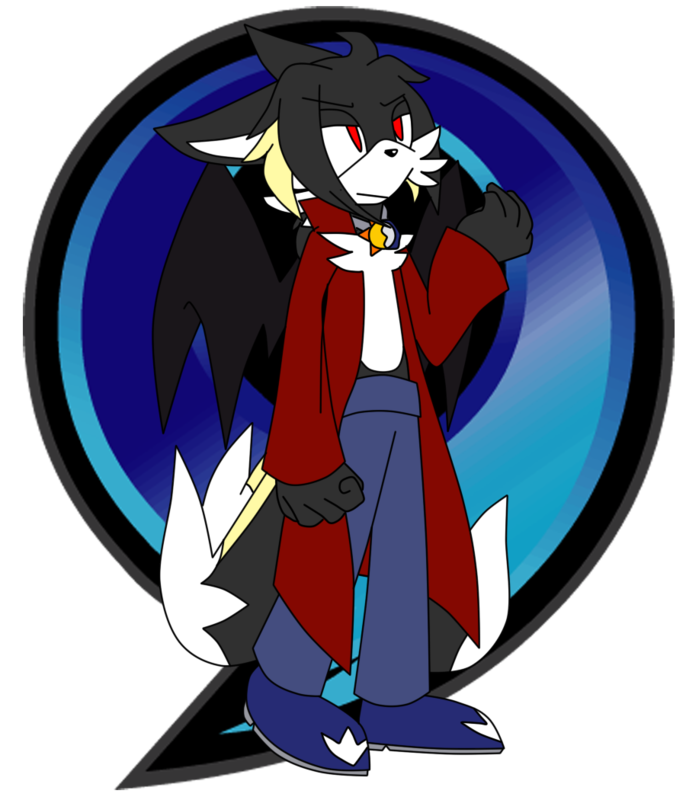 Dark Blades: Using his Umbrakinesis, Twilight can conjure up blades of darkness to use as swords, or to cloak his tails to turn them into weapons. He can also raise these blades and send them flying at an enemy for a long range attack. It is difficult for Twilight to shadow sneak in the darkness, as shadow's are more prominent in light. It's difficult for him to keep form in the darkness. Twilight is a bit frail, his wings especially. If his wings are damaged then he, obviously, will not be able to fly. His wings can reform over time but it takes a long time. Though Twilight is immortal, his one glaring weakness is his heart ("core"). If his heart is destroyed, he is completely wiped out from existance. He cannot reform his heart. Once it is gone, he is dead. Better yet, it's as if he never even existed in the first place. Twilight can conjure dark energy whenever he wants to, but it is weak in the light. Though it is not that weakened in normal daylight due to the emblem that hangs around his neck, it is only around 1/4 of it's strength in abnormally strong light. Lilac: Lilac is the one mobian that helped Twilight when he was alone and in need of a place to sleep. Shadows may be immortal, but going without sleep for a while can still make him feel a big groggy. He left the morning after Lilac let him sleep over, she even gave him food. Feeling as if he felt gratefulness for the first time, he went back to Lilac and thanked her. Occasionally, he visits her and helps her out with the store... but he's not allowed to deal with the customers. Pierce the Bat: Twilight's relationship with Pierce is weird. He often acts like he doesn't like the guy, but lets him stick around regardless. He will help him occasionally, especially if Pierce had helped him before hand. He probably likes Pierce as a friend, but won't admit it outright. Crush the Lynx: Twilight feels that Crush is a very reliable guy and would let him stick around if only for his usefulness. He is fine with Crush's mellowness and is more than willing to hang out with him- simply in silence. Amber Wolfe (PersimmonAutumn's Character): He's fine with her, almost to the point of infatuation. He doesn't think anything bad of her at the very least, not after their first encounter. He'd be willing to hang out with her again if the opportunity ever arose. Tyson Herrius 2nd (Tyson_the_Comet's Character): Ever since their fight, Twilight considers Ty to be of great annoyance to him, but enjoys messing with him all the more. They didn't get off to a great start, and Twilight doesn't seem to want to give him any chances any time soon. He seems to have a need to be better than Ty, however. He doesn't consider Ty a threat, but doesn't really like his presence overall. Twilight's story starts off just like any other Shadow's. He was given life by the Great Darkness, and promptly formed into a Mobian Kitsune. While he looked small and helpless, he possessed something that most other Shadows couldn't ever hope to have. A heart- a piece of mind- he was born into the rankings of the Greater Shadows, all of which were just like him. The first thing the small kit was tasked with was to fight his way out of the hoards of Lesser Shadows that would soon be headed towards him with the intent to rip his core out of his body. All Greater Shadow's have a solid "core" within their bodies. This core holds all of their emotions, their ability to reason and think critically and so forth. It's pretty much their brain, and many shadows are created "brainless" for the Greater Shadows to control. As brainless as they are, the Lesser Shadows are at least able to formulate that this core is a good thing. And a newly formed, seemingly helpless Greater Shadow with a sturdy core was too good to resist. This would have been the end of his story already if it wasn't for the gift that the Great Darkness had granted him. His own Umbrakinesis let him control the negative emotions of himself and others. Scared and upset by the Lesser Shadows coming at him, the negative darkness of his released itself in a blast around his body- vanquishing a few of the Lesser Shadows after him. The Kit was able to carve himself a path through the much weaker Lesser Shadows- but their numbers overwhelmed him and he was left exhausted and actually helpless. When he thought he was done for, another being appeared to come to his rescue. It was a wolf- he was big and powerful. His savior was very clearly another Greater Shadow- a Shadow just like him. This Shadow used powers that the Kit had not seen before in his short life. The Shadow came to him and introduced himself as Vesper. The Kit was hesitant, but he stayed close to Vesper and decided to trust him. It was then that Vesper bestowed the name of Twilight to the Kit. Vesper guided Twilight back to the place he ruled over, the wolf ruled over an entire kingdom of Lesser Shadows by himself. The Lesser Shadows in Vesper's Kingdom did not come after Twilight like the others did, for Vesper was able to command them as he saw fit. Power this immense was almost overwhelming to the young Shadow, and it wouldn't be long until he was taught that this was simply the way things were. In Vesper's Kingdom and all of the Realm of Shadow, there was a strict pecking order that had been established for centuries- and Twilight was within the elite ranks. Twilight grew up and trained under Vesper's guidance, so that he may one day rule his own kingdom. Little did he know of what the Wolf Shadow was planning behind his back. Twilight trusted Vesper with every fiber of his being because he, of course, was the one who saved him from being nothing more than an afterthought by the Great Darkness' part. Years passed, many, many years passed. Twilight grew up quite fast, all Shadows did. The speed at which they grew up in no way corresponded to their lifespan, as they did not have one. Once Shadow's lived to a certain age, they gained the ability to make themselves look as young- or as old- as they wanted. Twilight had not yet reached that year himself, and still looked like a child. To Vesper, however, his core was just powerful enough to be ready for his taking. On that fateful day, Vesper approached him and took him aside to a rather hidden area. All eyes averted from the scene that was about to take place, Vesper pounced. He lunged at Twilight, and thrust his hand towards his chest. Twilight was startled and confused, but he tumbled out of the way. Eventually, Vesper was able to grab at Twilight's core but Twilight pulled away and struggled as Vesper was tearing it from his body. Vesper broke a piece off of Twilight's core, about a quarter of the entire thing. Vesper wouldn't give up there, he wanted the entire thing, and he lunged at Twilight again. Twilight was still confused and upset by the entire thing, but the same power that he had been trying to master his entire life showed itself again. A blast of dark energy propelled Vesper back, giving Twilight time to escape. Twilight ran, he ran as far as he could, and though Vesper pursued him- his extreme greed was his downfall and it only served to give Twilight more power to get away from him. Eventually, Twilight got far away enough that he could hide and rest- but he knew that he had to keep going. The look in Vesper's eyes told him that Vesper would never stop pursuing him. He wasn't sure why Vesper would do such a thing, especially after the years he spent raising him, but that wasn't important anymore. What was more important than anything was that he survived, Twilight knew that, it's something the Vesper even taught him. But Twilight was also taught to always obey him. Survival came first, Twilight knew that. If that wasn't the case, he wouldn't have struggled. When he felt he rested up enough without eating up precious time, he started to run again. He hid from all Shadows for as long as he could. He couldn't afford to be seen by anybody. Without a full core, he was no longer among the rank that he was born into. By losing part of his core, he was outcast. He was a freak, even the wild Lesser Shadows cast him out. A partial core was not worth their time. He thought he was alone for a while, but eventually he bumped into a small camp. It was outlandish, something like this in the middle of nowhere and in between kingdoms no less. Shadows weren't known for their stellar camping trips. Curious, he watched this camp. When he saw other Shadows coming in and out of the makeshift tents and going about their daily business, it confused him greatly. It wouldn't be long until one of these strange Shadows spotted him. At first, the group of them got defensive and looked ready to strike him at any time. As Twilight stood there dumbfounded, they slowly started to realize that they were meeting another one of them. Another Shadow with a partial core. It took a lot of convincing, but the partial cores were able to get Twilight to settle down with them. The Partial Cores leader, Charna, explained to Twilight that stronger, more experienced Greater Shadows have tried time and time again to collect the power of other Greater Shadows. The ones that managed to escape with parts of their core still in tact were out cast by all other Shadows, however. The Partial Cores formed a ranking of their own, something below even the Lesser Shadows. The Partial Cores were nomadic, and moved around in case there were still Greater Shadows coming after them. Over time, each of the partial cores opened up and told their stories to Twilight one by one. After he knew of each of their stories, Twilight eventually told them of Vesper and what he tried to do him. A few of the partial cores, Charna included, had heard of Vesper. None of them had ever encountered him before. Over time, moving around the realm of shadow with the partial cores, Twilight began to get ideas of leaving the realm. He had heard of other existing realms, and the one closest to theirs interested him the most. As the partial cores moved around the realm, Twilight gathered as much information as he could about crossing realms and the power it took. He infiltrated the most nearby kingdoms to rob them of their knowledge and left undetected. Sometimes he would almost get caught. Every time he gained even a little bit of knowledge, it would be as a result of him risking his life. He thought it was worth it though. The moment he figured out what it took to cross realms, he wanted to put it into action immediately. He knew he only had one shot at succeeding at this. Unfortunately, that same night, the partial cores were finally caught by one of the Greater Shadows that had probably been pursuing them. And who else but Vesper. Vesper immediately made a mad dash for Twilight, but a few other partial cores who retained their caring aspect defended him. As they did, Twilight tried his best to pay no mind to the commotion behind him as he started to put his realm crossing plan into action. Those partial cores ended up losing their cores- and power to Vesper. They disappeared, and they'd never be seen again for they now existed inside of Vesper- as a part of him. Twilight didn't look back as he left the Realm, after all, surviving was the most important thing as along as he survived that's all that mattered to him. In his crossing, Twilight lost consciousness. Probably not safe, but when he opened his eyes he seemed to be somewhere safe enough- but the light that he opened his eyes to wasn't very welcoming. As a creature of darkness, the sudden sight of something so bright and happy was very unusual. He looked around. No Vesper, no partial cores either. The partial cores were probably no more, they had probably fallen to Vesper. Twilight didn't seem to think much of this at all. He didn't give one ounce of caring to any of the partial cores he traveled with. They were only there to benefit him, after all, weren't they? This new world was strange, but he'd have to get used to it. With no Shadows here to hunt him down or outcast him, he had a new start. Here, he would start his life over again. And that he did, though it was hard for he didn't really know the customs of the land. He ended up wandering around for days, even fighting off a few wild creatures and ruffians but with little problem. It wasn't long- for him anyway- until he stumbled across a city of great size. It was nothing like the Kingdoms back in the Realm of Shadow. None of the creatures walking the streets seemed to be slaving away for the benefit of one person either. It was weird, but he shrugged and gave this weird place a shot. Talking to anybody didn't really do him any good. They would get angry or offended by his tone often, or maybe plain confused at the way he spoke or what he spoke of. Some of them laughed at him and made fun of him, but he didn't really seem to care. If they had no information for him, he moved on to the next person. Eventually people started to avoid him during the days he stayed there. One night as he was wandering around, he came across a vixen fighting off some attackers. This intrigued him, but he had also never come across these specific creatures before. He walked into the middle of the struggle rather nonchalantly and started to strike up a conversation though it seemed obvious enough to the attackers that he had no idea what was even going on, so the vixen's attackers immediately turned on him. He immediately disposed of them and turned to the vixen for information. Information on anything, the world in general. Shaken and confused, the vixen didn't have anything for him. She seemed to still be trying to make sense of the situation. Twilight picked the vixen up and flew her away to an area he deemed safer than the one they were in before. She didn't really take well to it and turned on him as well. Twilight backed down from another fight, as he was running out of energy quickly. Soon, the vixen introduced herself as Lilac. She wanted to know what Twilight's deal was, so in exchange for a place to sleep, Twilight told her his story. It was simply unbelievable to her at first, a fairy tale at best. His wings were firmly attached to his body though, and he clearly sucked the negativity out of Lilac and turned it into his own power. As soon as he demonstrated his abilities, she began to believe him at least a little bit. Lilac had seen a lot of weird things before, but nothing as weird as Twilight. With that, Twilight was granted a place to sleep. Lilac had even given him something to eat even though he could have survived without it. The next day, Twilight felt something inside himself he didn't think he had ever felt before. Whatever it was, it made him feel good. The good feeling was almost irresistible. He knew he wanted more, but he didn't know how to obtain more of the good feeling. He left Lilac as soon as he had woken up that next morning without saying a thing. He had decided that he wanted to stay close to this city, however. In his days of getting used to this realm's customs and what not, he visited Lilac regularly and helped her out in running her flower shop. He gained an appreciation for gardening, and slowly started to turn his life around. ... because the only thing that mattered was survival, wasn't it? Perhaps life isn't as black and white as he thought. Twilight still continues his strange misadventures, whenever he isn't helping Lilac he goes off looking for a place where he can keep to himself and make sense of the emotions buzzing around in his core. One day, he'll have a full core of his own again. So long I put it in under a cut. This is a good character. I like his vampire-like backstory and power, His conflict with Vesper is also interesting in that, while Twillight is minding his own business, he isn't immune to the greater evil bounded by jealousy and selfishness. Twilight's brooding and conflicting personality has a lot of potential to develop, especially if his love interest Lilac - a key person toward Twilight's mental stability - is properly handled. It would be great if there are more infomation about her in the future. The problem with the character and setting, in my opinion, however, is easily darkness induced. From the very start, the Shadows seem not a happy race. Twillight is constantly stalked by evil while he rejects any opportunity to have companions. His character's theme is that the world is ambiguous, and any interaction he makes to other people is irrelevent. ธherefore, it's hard to say there is a conflict between good/bad, but rather the actual theme is about a man's struggle to survive a harsh world. From this, it can be said that your ending remark "Perhaps life isn't as black and white as he thought" is ironic. Up until Twillight meets Lilac, there has not been any light in Twillight's heart. If there's anything Twilight learns from from his new experience, it's "Perhaps life isn't as empty and pointless". if such message is the core theme to his development, you can expands his character in many perspectives: fighting Vester, protecting the girl, gaining more friends and emotions, etc. This would make the character more realistic and likable. I have a feeling that being erased from existance is a bit overkill, especially if the story's about gaining experiences and ebracing humanistic qualities. There's a risk if he character is killed, everything about him will be loss, and the whole story will be pointless. As a fan character that isn't supposed to die very soon, this bit is also quite irrelevent to the character. Unless, of course, this is the whole point. maybe your theme is about not forgetting, or taking risk for the greater good. In such case, you need to be sure that, even if Twillight dies and he is erased from existance, what he has done will retained and remain meaningful. Such theme can creates an emotional star-cross lover story or something similar. It's all up to whether you can use his weakness as the plot point or not. All in all, this a good read. Keep up the good work. Like I said, I'll look forward to read about Lilac if you'll ever post about her.